Dimensions : 700 x 500 x 600mm (L x W x H) Thickness: Double Wall Qty: Single units can be purchased, bulk pricing applies call us. Packing Limit: 25 kgs Colour: Brown / craft Items can be purchased online or shop at one of our Pack Now branches. Our double wall linen box is built for extra weight and heavy linen and clothing items. 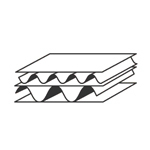 This box is constructed from double thickness board offering twice the strength of a normal box. Dimensions : 450 x 300 x 300mm(L x W x H) Thickness: Single Wall Qty: Single units can be purchased, bulk pricing applies call us. Packing Limit: 15 kgs Colour: Brown / craft Items can be purchased online or shop at one of our Pack Now branches. Our small moving box is for moving smaller heavier fragile items.